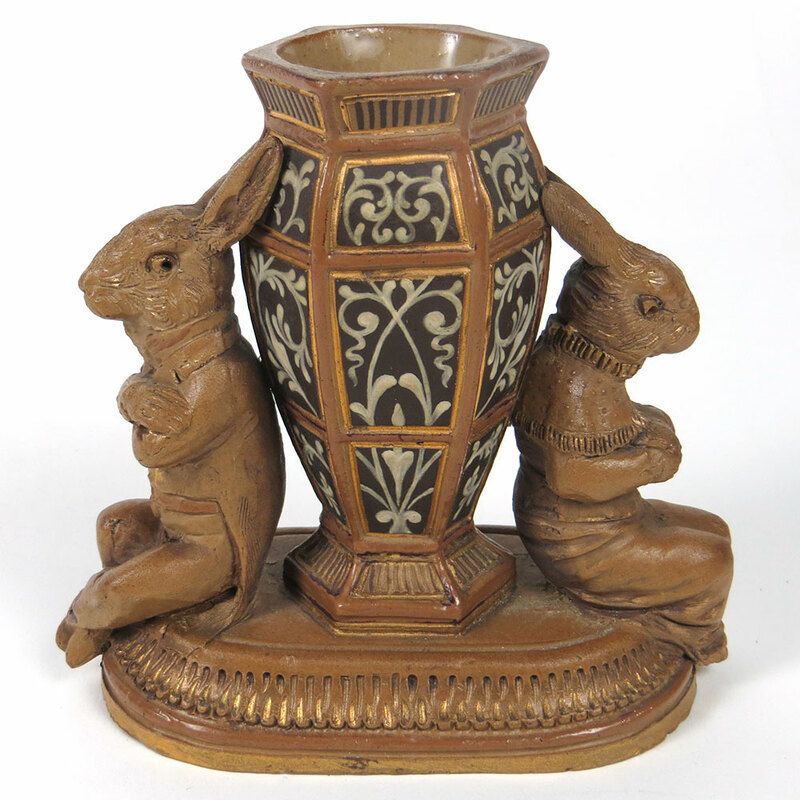 With Easter approaching the shops are full of fluffy bunnies but how did the rabbit come to be associated with this religious festival? 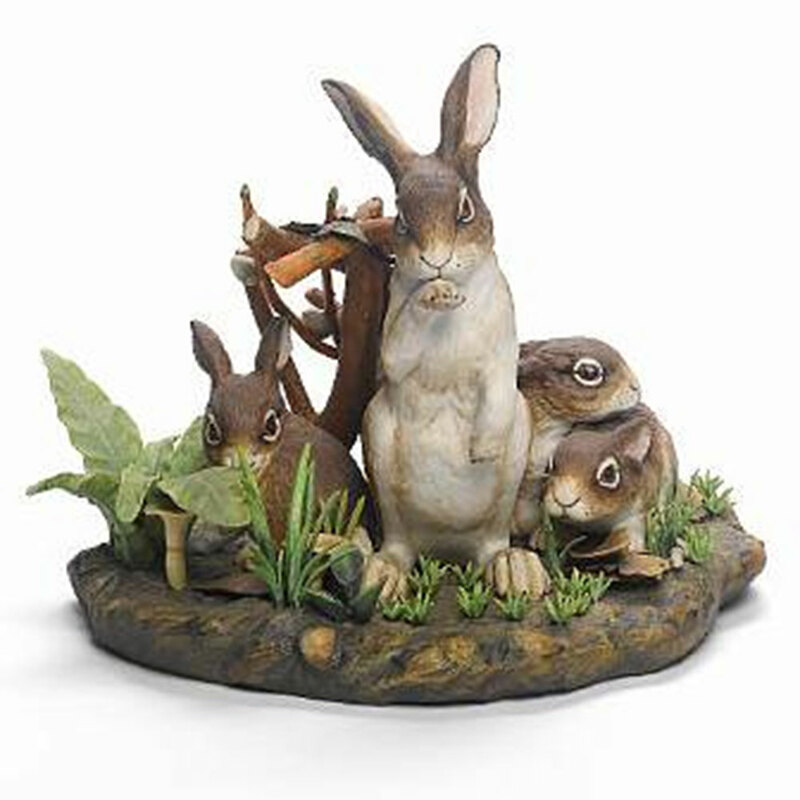 It all stems from the confusion between rabbits and hares, which were sacred to Eastre, the Anglo-Saxon Goddess of Spring. Ritual hare hunts were held to placate Eastre which were challenging events as hares can reach up to forty miles an hour with their unusually long hind legs. 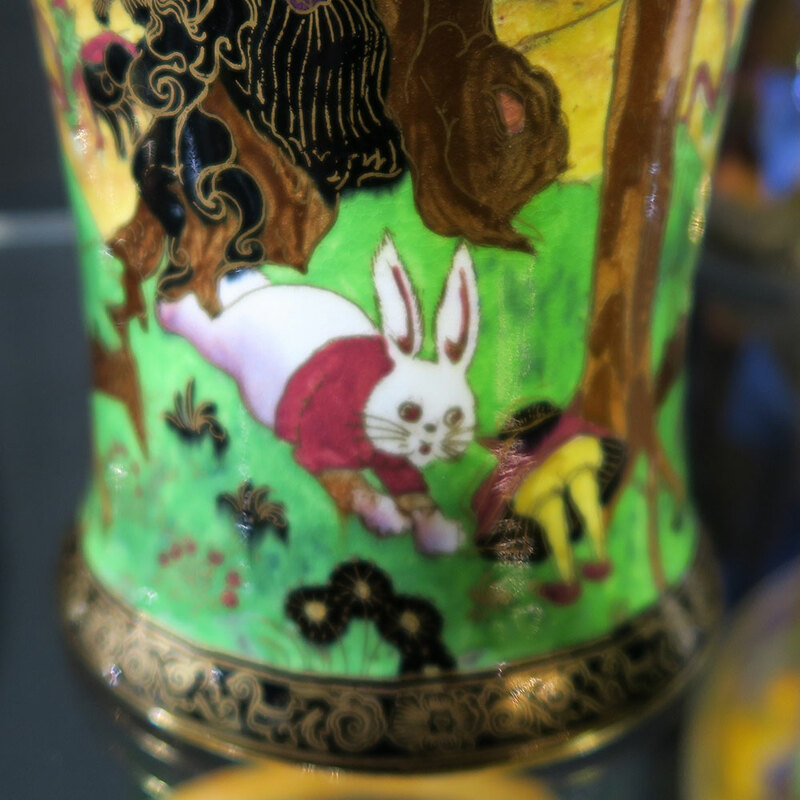 With the advent of Christianity, the pagan celebration of rebirth was absorbed into the Easter festival and the potent symbol of the hare was replaced with the fluffy Easter bunny. Typically, rabbits are smaller than hares with shorter ears and hind legs. The pet name ‘bunny’ is a diminutive of ‘bun’, a provincial word for a tail. Certainly, the white tail is the most noticeable feature of the timid wild rabbit as it disappears down its burrow when disturbed. 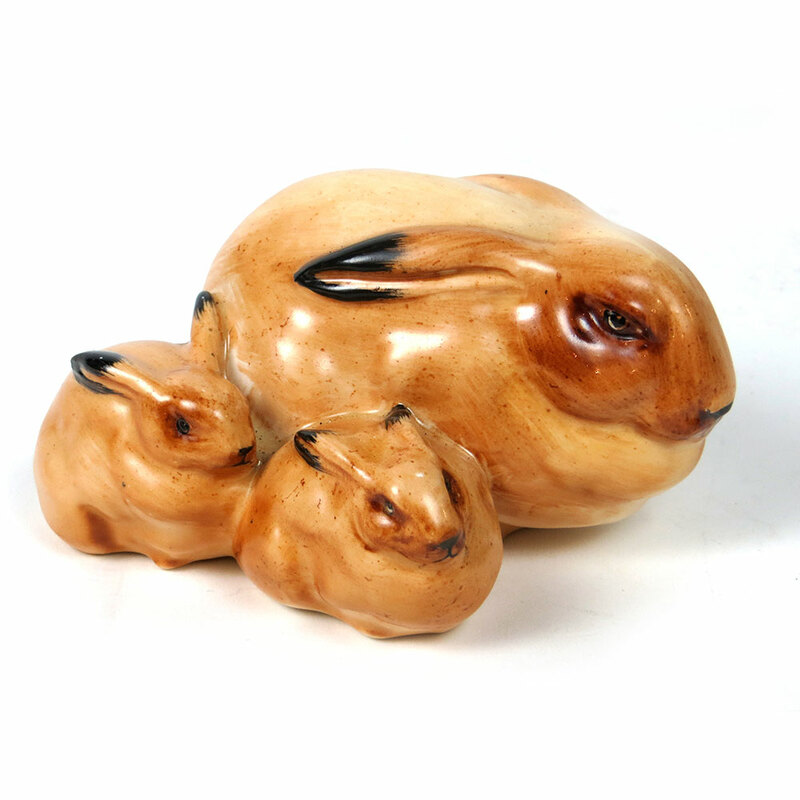 The hare is also a symbol of night and they have been associated with witches who are reputed to take their shape to escape pursuit. 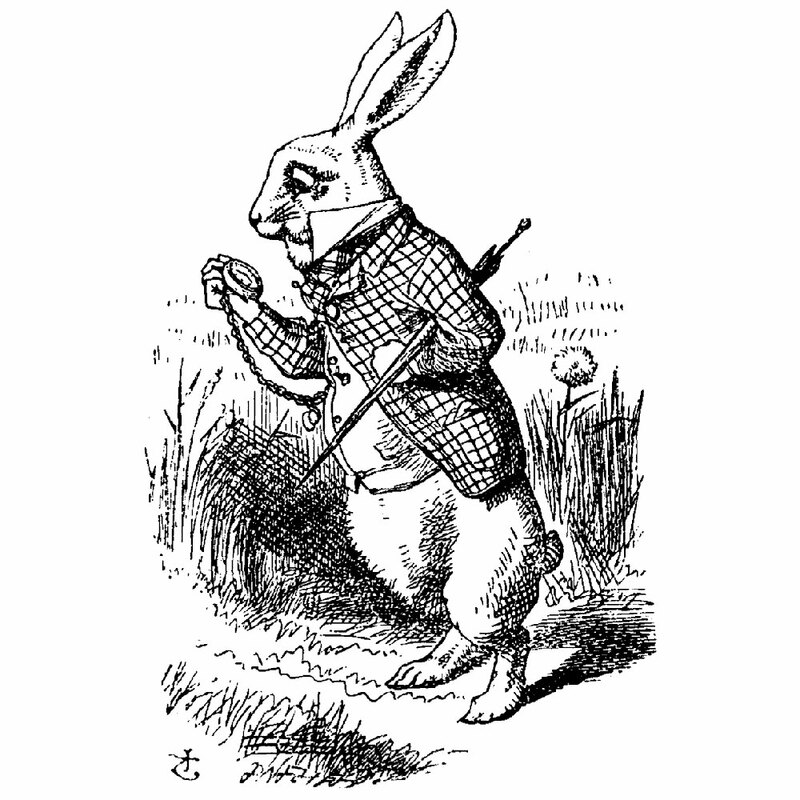 The expression ‘mad as a March Hare’ alludes to the frenzied activities of the male hare during its rutting season, which inspired Lewis Carroll to create his March Hare character in Alice’s Adventures in Wonderland. 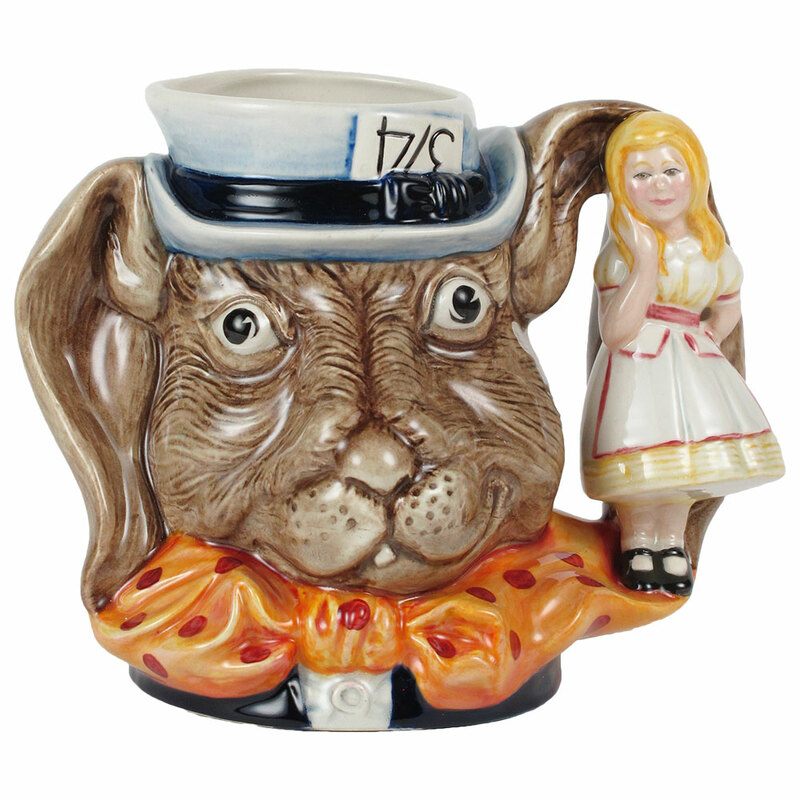 The Fantastique exhibit at WMODA features a unique Royal Doulton prototype of the March Hare with Alice on the handle. 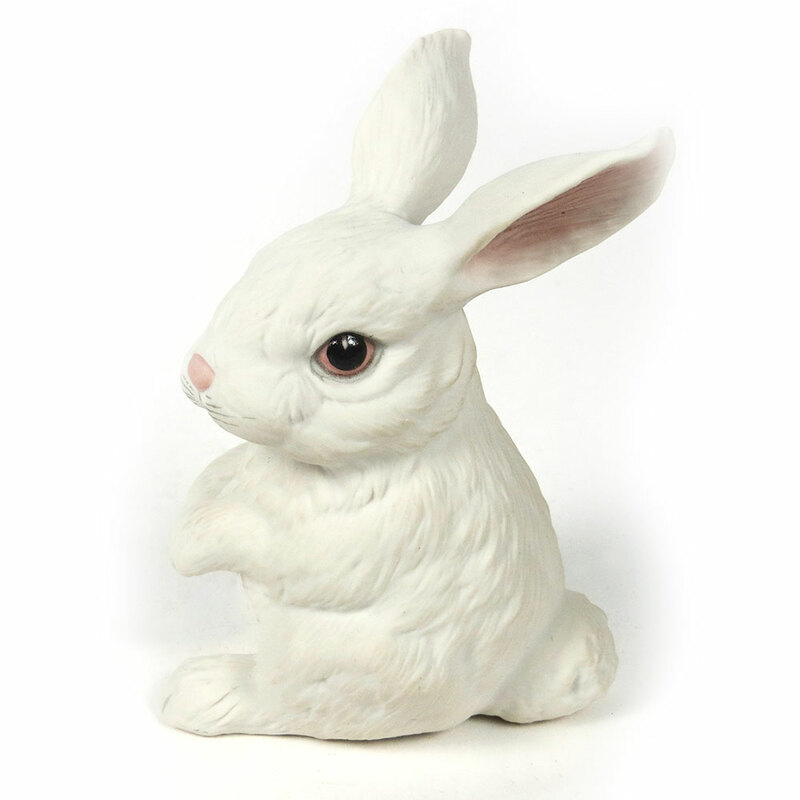 Carroll also gave us the White Rabbit who sparks Alice’s curiosity and spiritual awakening and leads her down the rabbit hole to Wonderland, a symbol of her quest for knowledge. 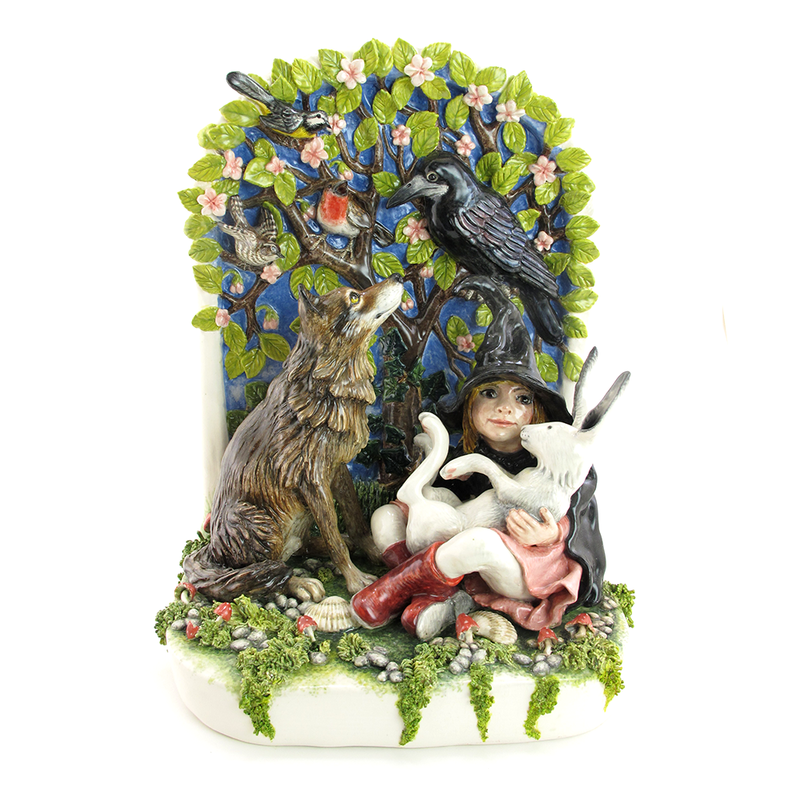 Surprisingly, Alice and the White Rabbit appear on a sinister Wedgwood Fairyland Lustre piece depicting a Ghostly Wood. 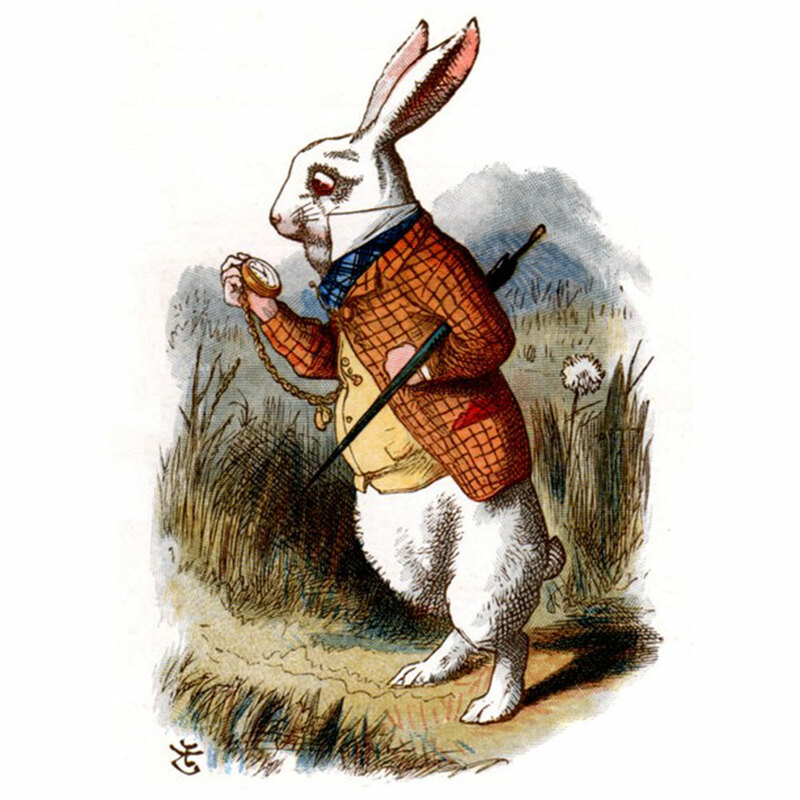 Next to the White Rabbit, Peter Rabbit must be the most famous fictional rabbit in the world and his tale has been published in 29 different languages. 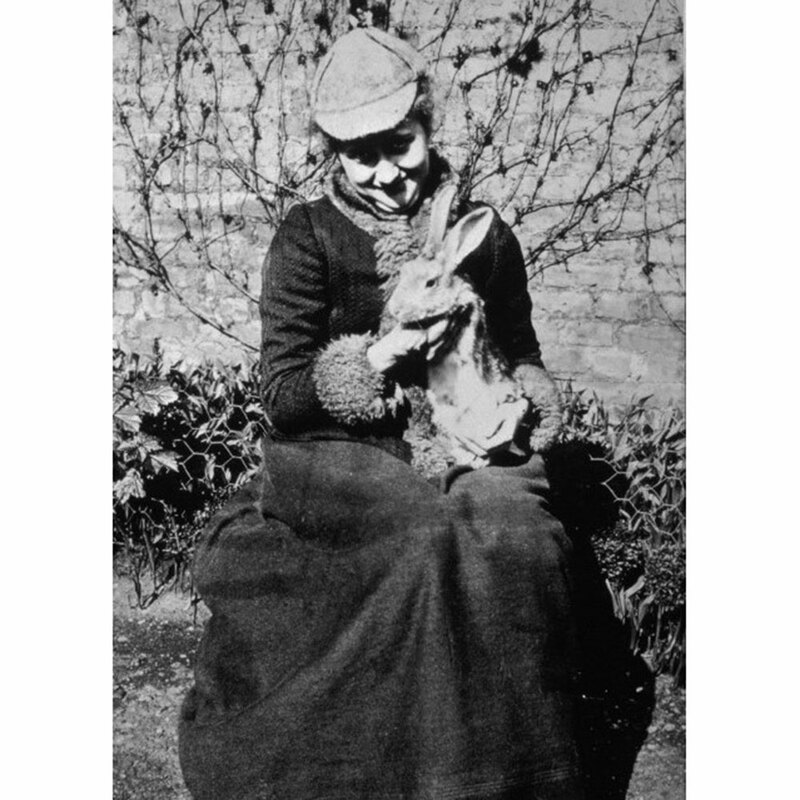 Peter was Beatrix Potter’s beloved pet and the inspiration for her first book in 1901. 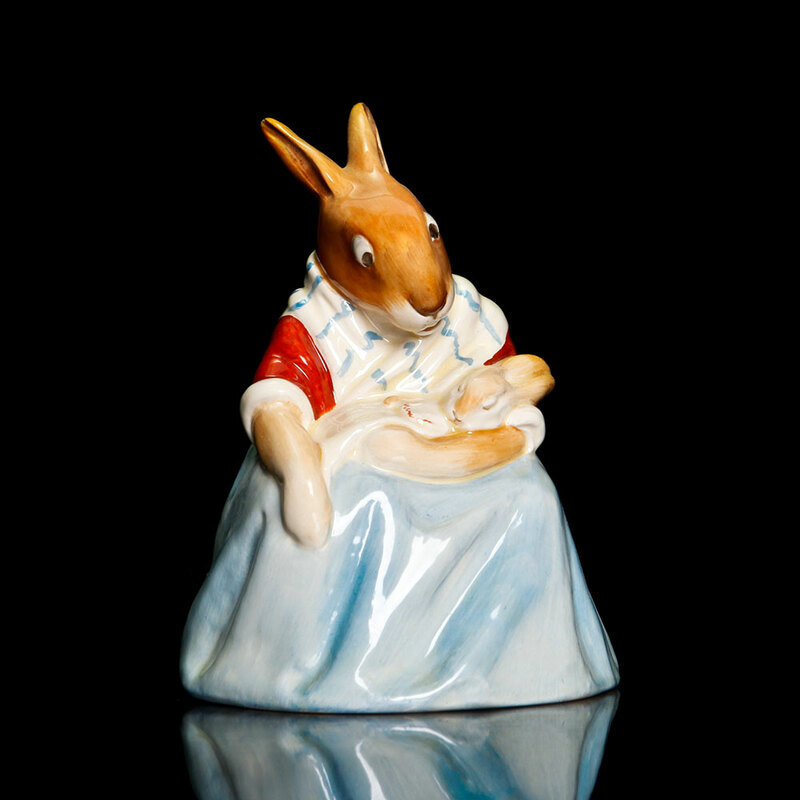 He acquired clothes for her stories, which inspired a collection of Peter Rabbit figures from the John Beswick factory, now part of the Royal Doulton group of companies. 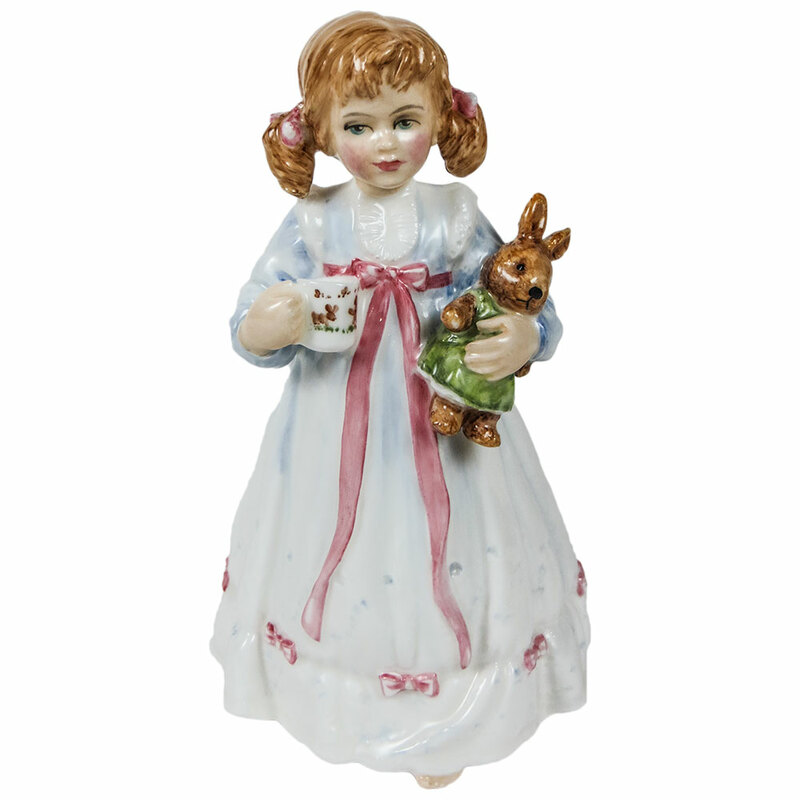 Bunnykins are Royal Doulton’s best known rabbits and their antics have been enjoyed on nursery ware for 80 years. 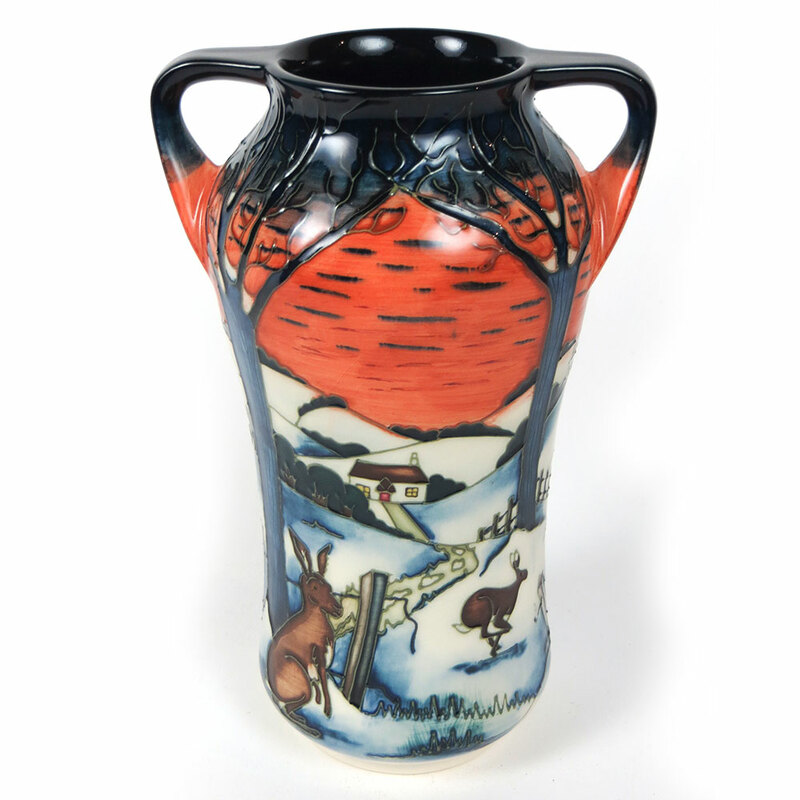 A Bunnykins rabbit shaped teapot was introduced in 1939 together with a sugar bowl and cream jug and six figures were modeled by Doulton’s art director, Charles Noke. 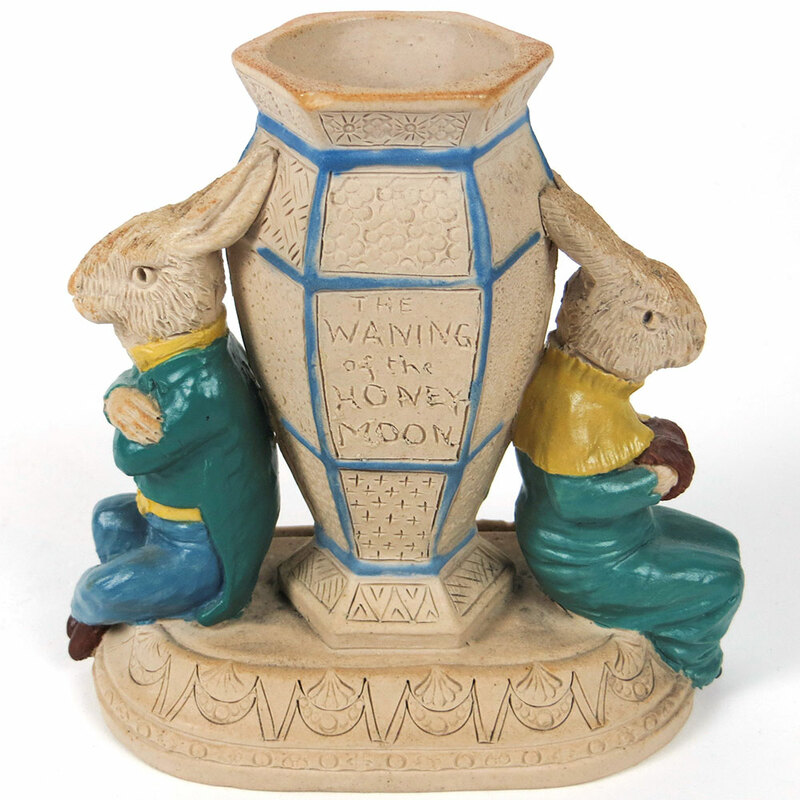 He often dressed up animals in human clothes and in 1913, he introduced a Hare in Hunting Dress HN101, satirising the once popular sport of hare coursing. 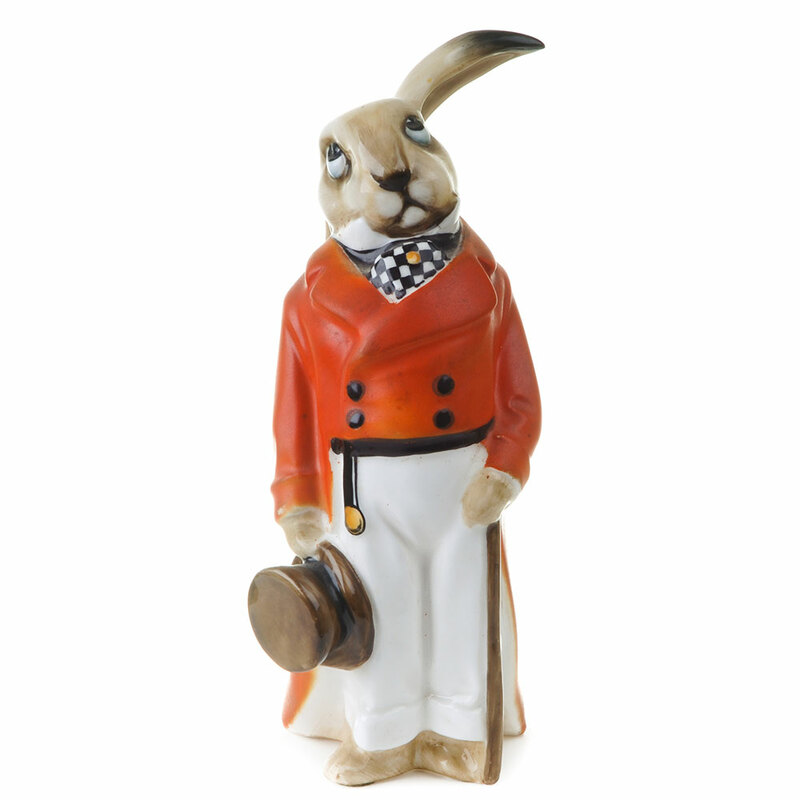 This dapper little chap is also known as Rabbit in Morning Dress. 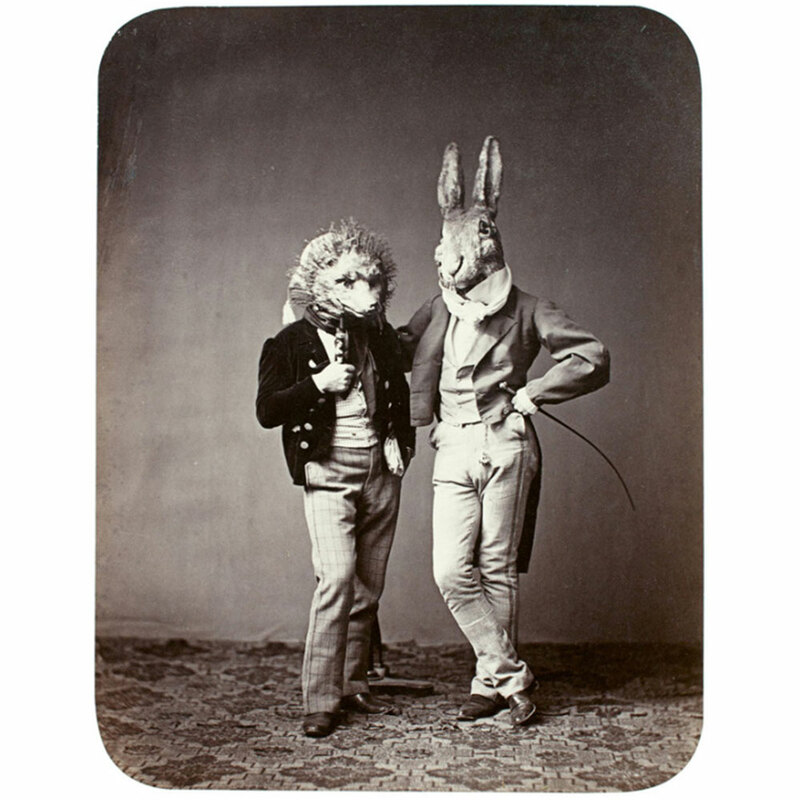 Rabbits in human clothes did not seem strange to the Victorians in the light of Darwin’s revelations that man was descended from the apes. 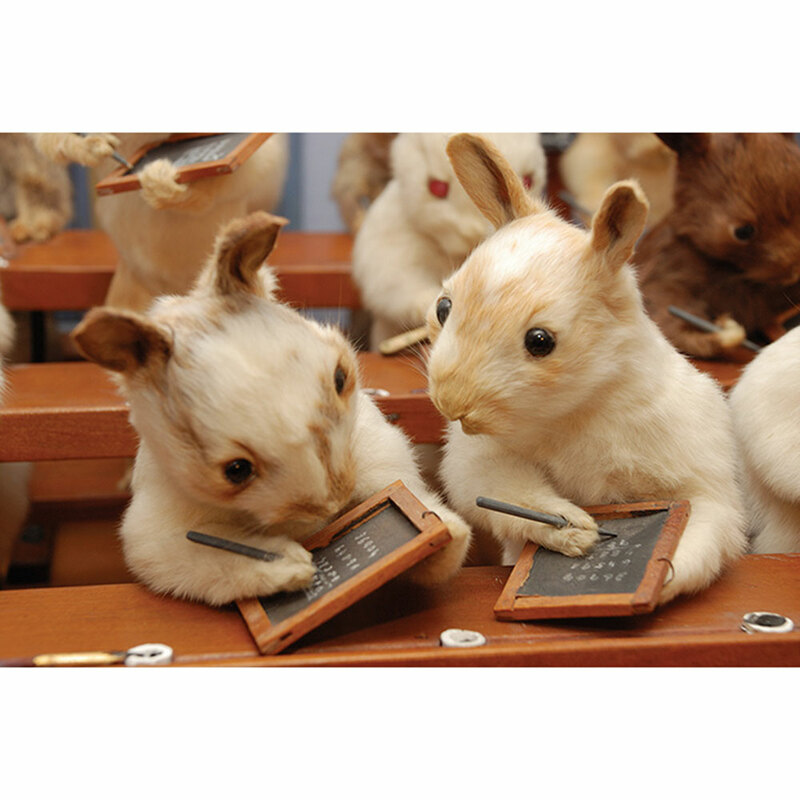 The popular press was full of anthropomorphic cartoons and taxidermists also entered the spirit of the times. 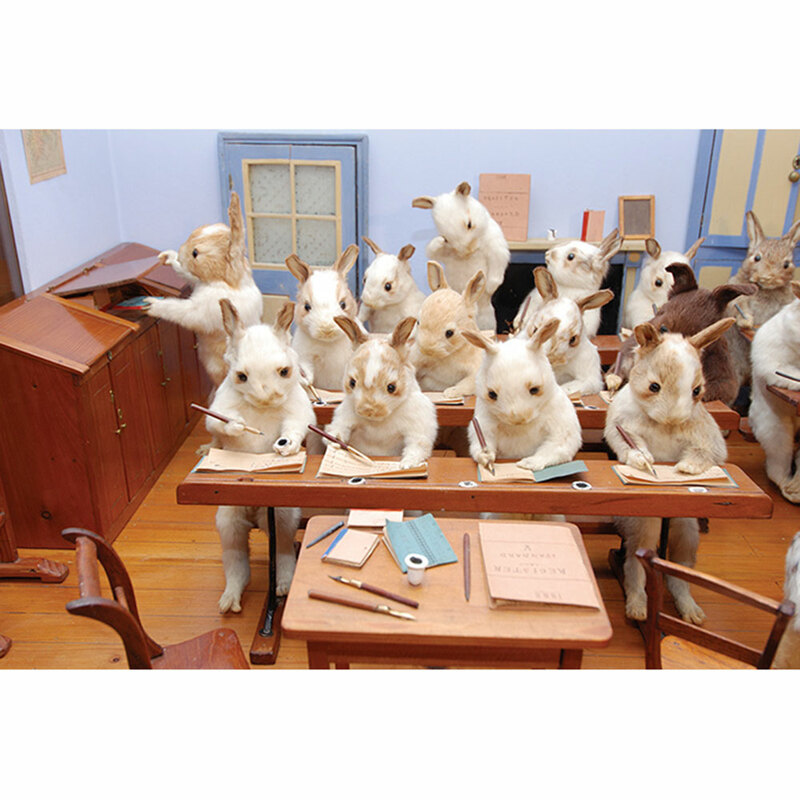 One celebrated exponent, Walter Potter of Bramber in Sussex, created an elaborate tableau featuring 48 rabbits working at their desks in a village school. 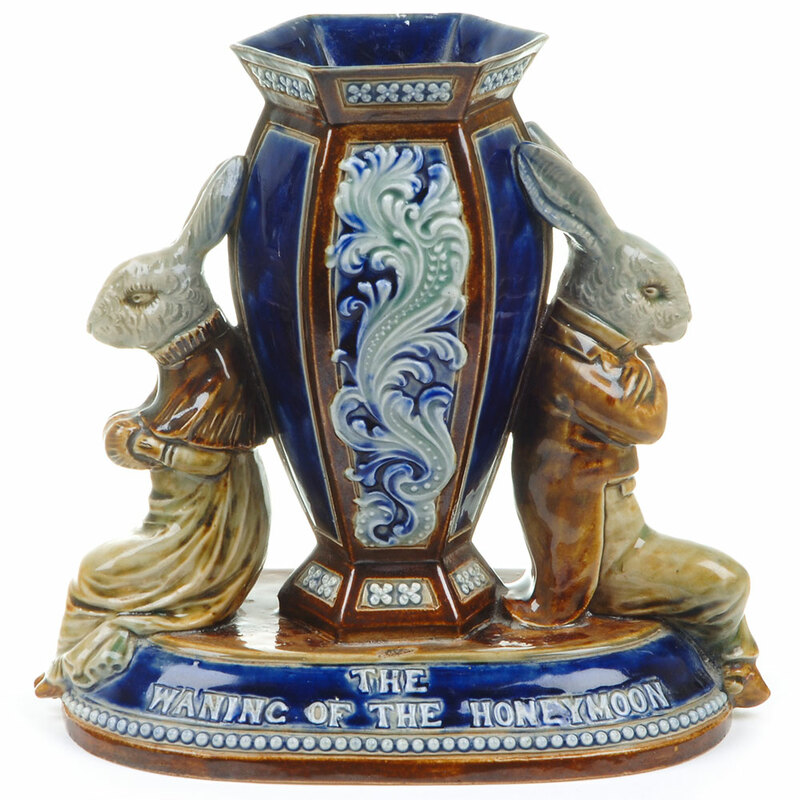 Mark V. Marshall, an artist at Doulton’s Lambeth studio in London, modeled several stoneware rabbits enacting human situations. 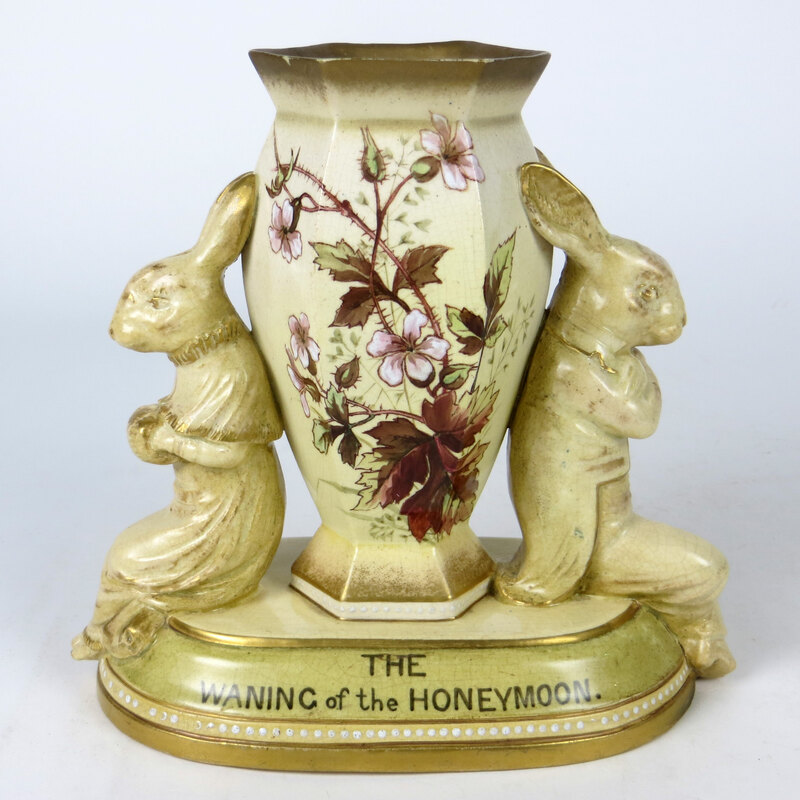 His most famous work The Waning of the Honeymoon depicts a newly wed rabbit couple looking very jaded, which was made in several glaze effects. 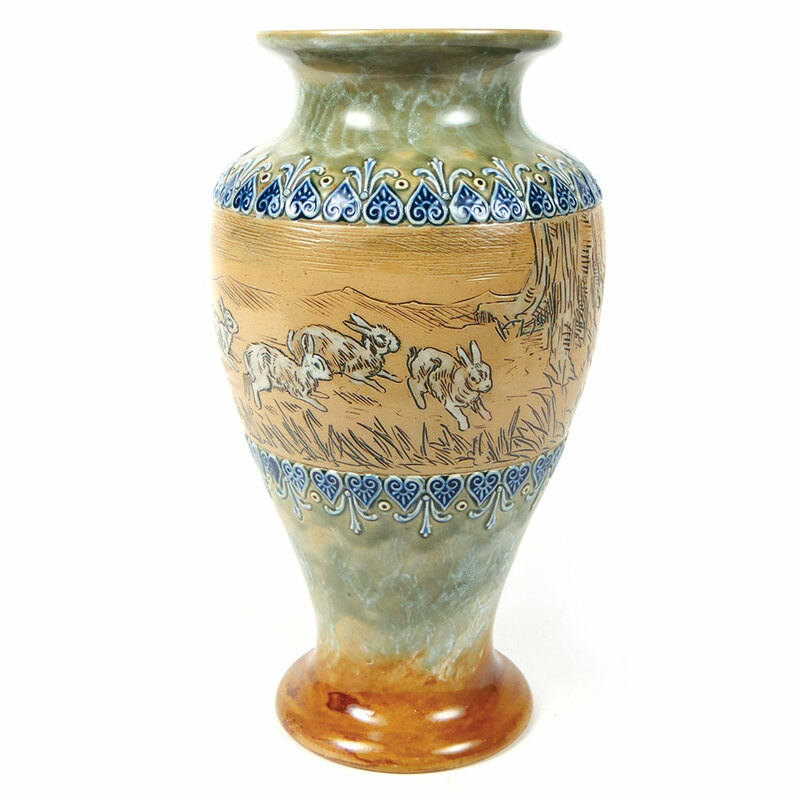 Marshall also designed vases featuring rabbits and may have inspired the jardinière incised with rabbits by the Martin Brothers studio where he worked for a few years. 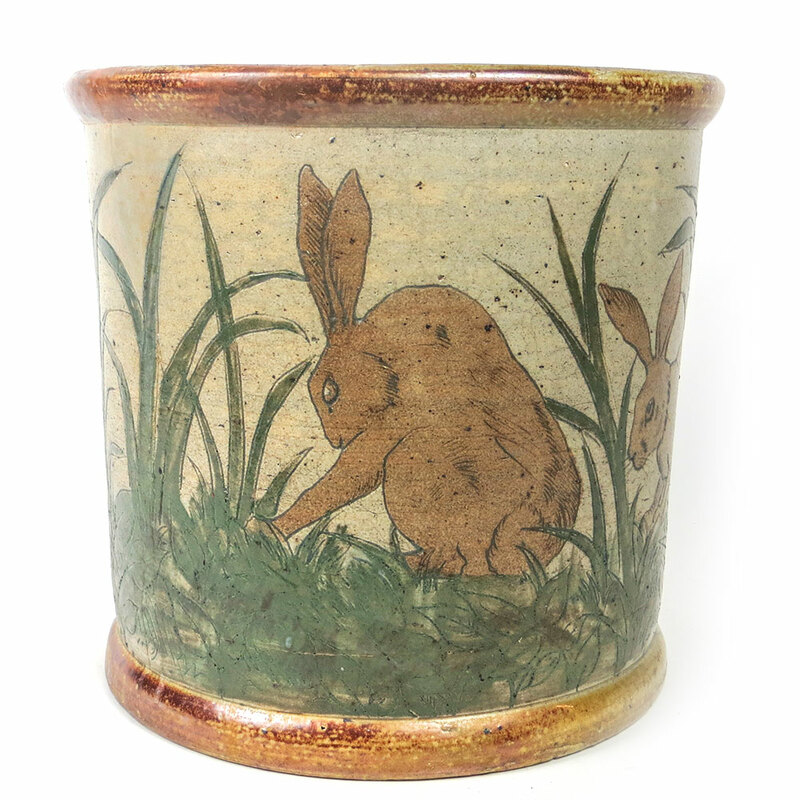 Hannah Barlow, the first lady artist at Doulton’s Lambeth studio, also loved rabbits and often featured them in her incised stoneware designs. Children’s books continue to feature rabbits with human abilities. 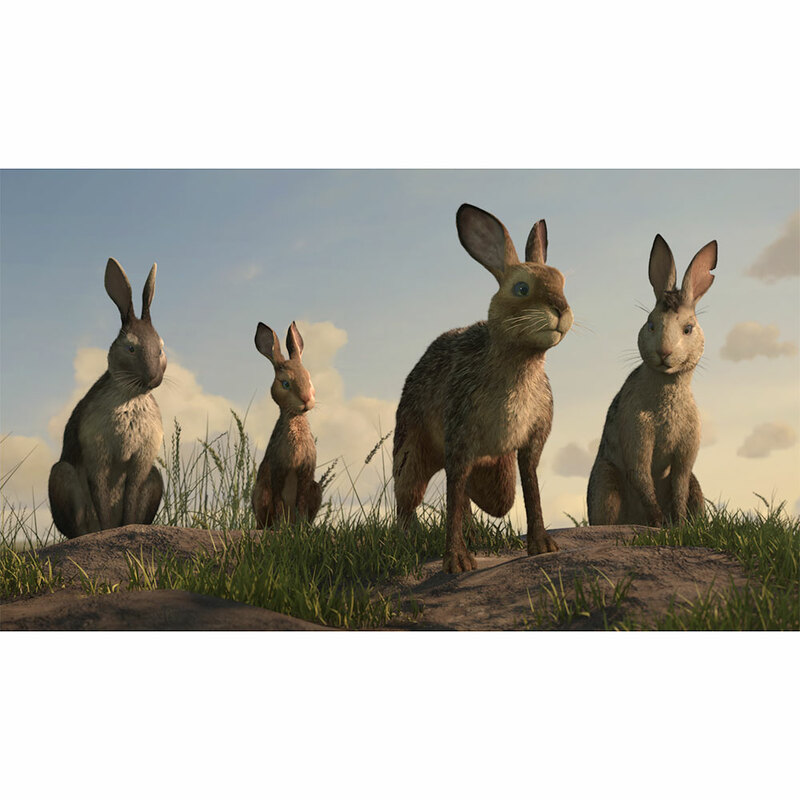 Watership Down by Richard Adams was recognized as the best children’s book of the year in 1972. It was made into an animated movie and the theme tune Bright Eyes by Art Garfunkle became a number one hit in 1978. An enterprising, albeit insensitive butcher in Ledbury drew attention to his display of rabbits for sale with a notice “You’ve read the book and seen the movie, now eat the cast”. Rabbit pie has long been a traditional dish in England and was a staple of American pioneers. 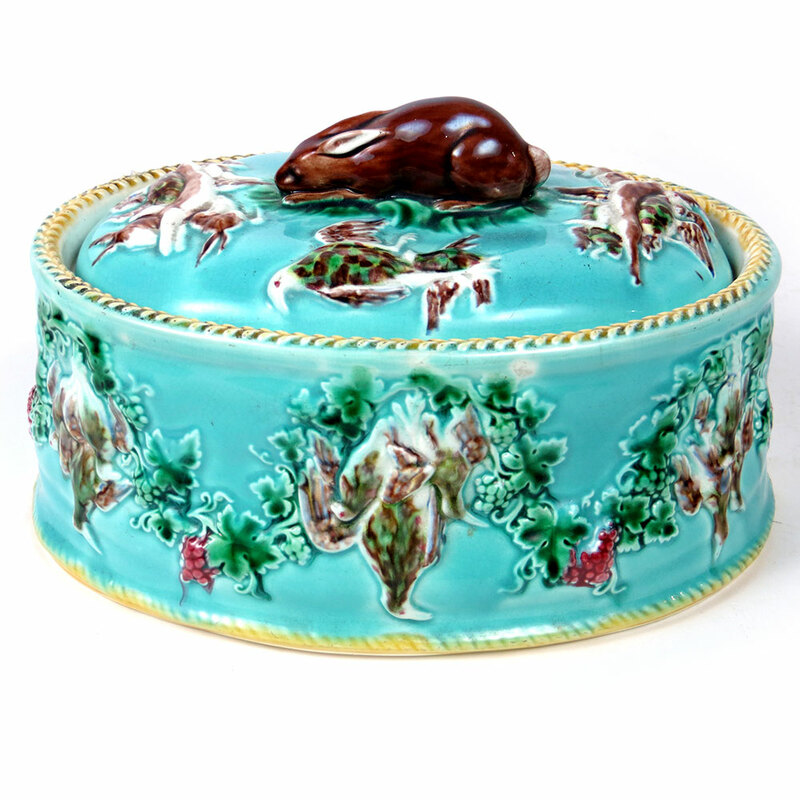 Wedgwood made colorful majolica tureens for game pies, including rabbits. 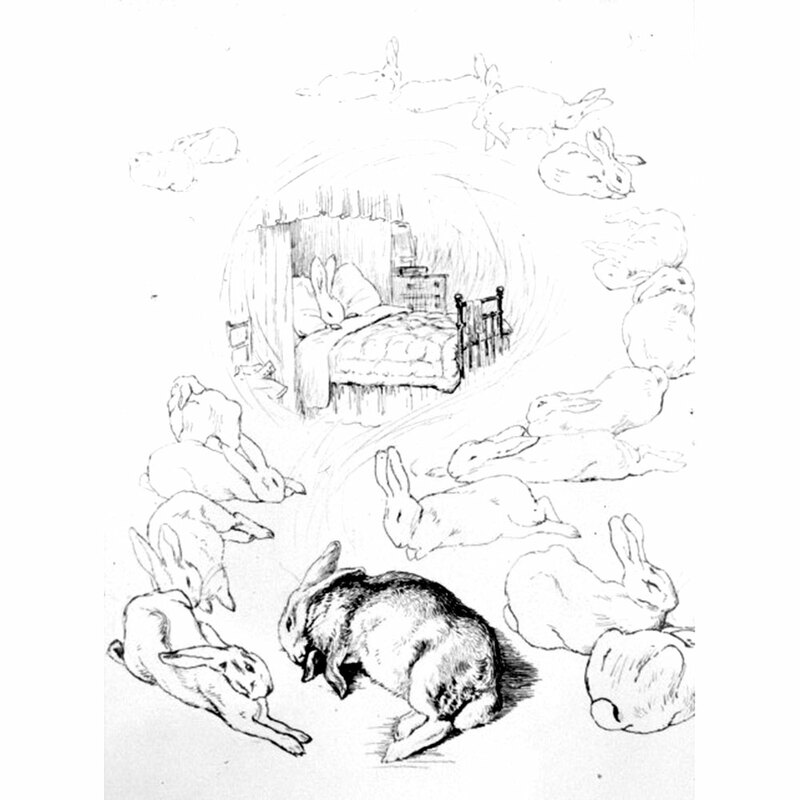 In Beatrix Potter’s book, Peter Rabbit’s father was put into a rabbit pie for going into Mr. McGregor’s garden. 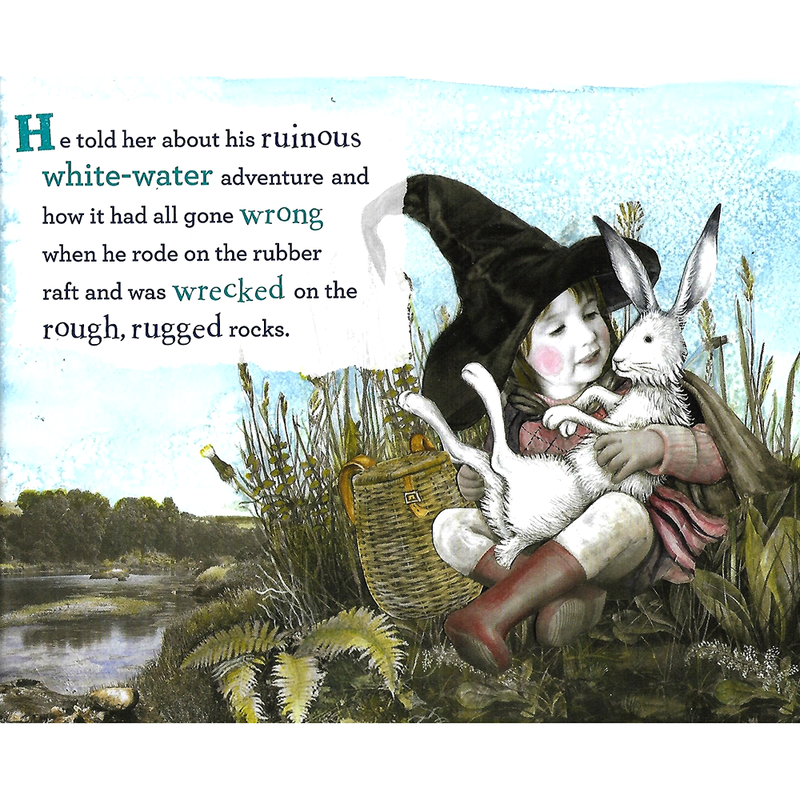 The most recent rabbit book represented at WMODA is Michele Coxon’s One Wet, Worried White Rabbit which tells the story of a bunny who goes white water rafting and is rescued by a witch. Michele is one of Britain’s best loved children’s illustrators and her books have sold over a million copies worldwide. 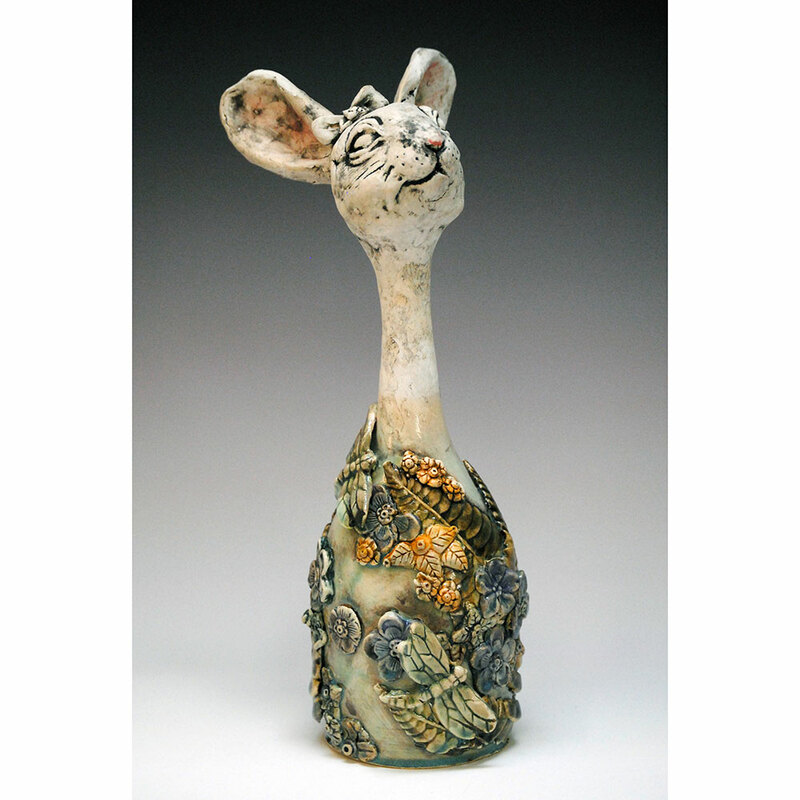 She has drawn and painted since childhood, but she didn’t begin working with ceramics until later in her career. 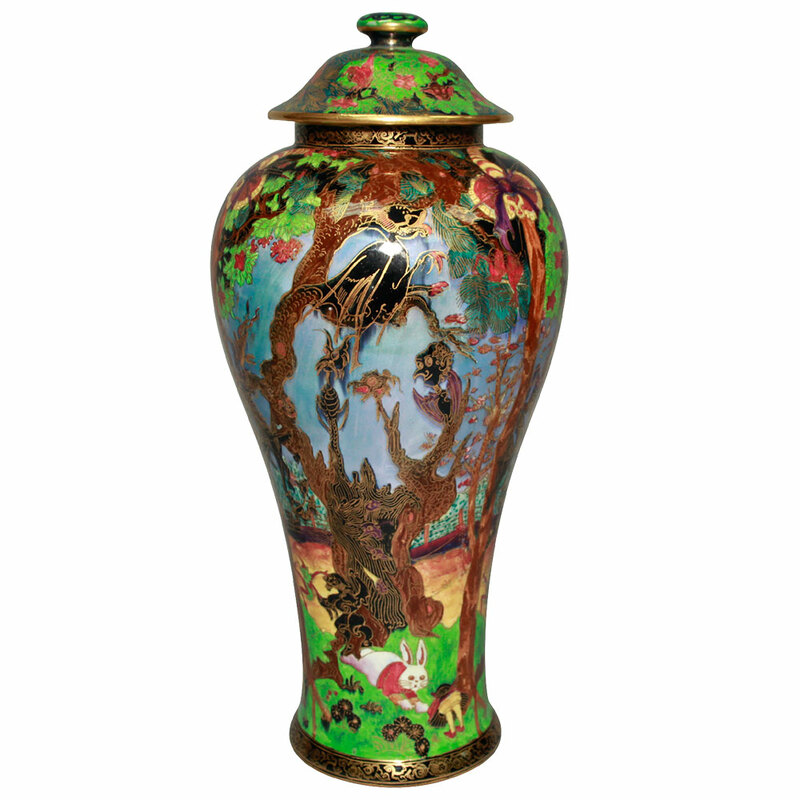 Her theatrical tableaux are unique, hand-built clay models which resemble Staffordshire flatback figure groups from the 18th century. 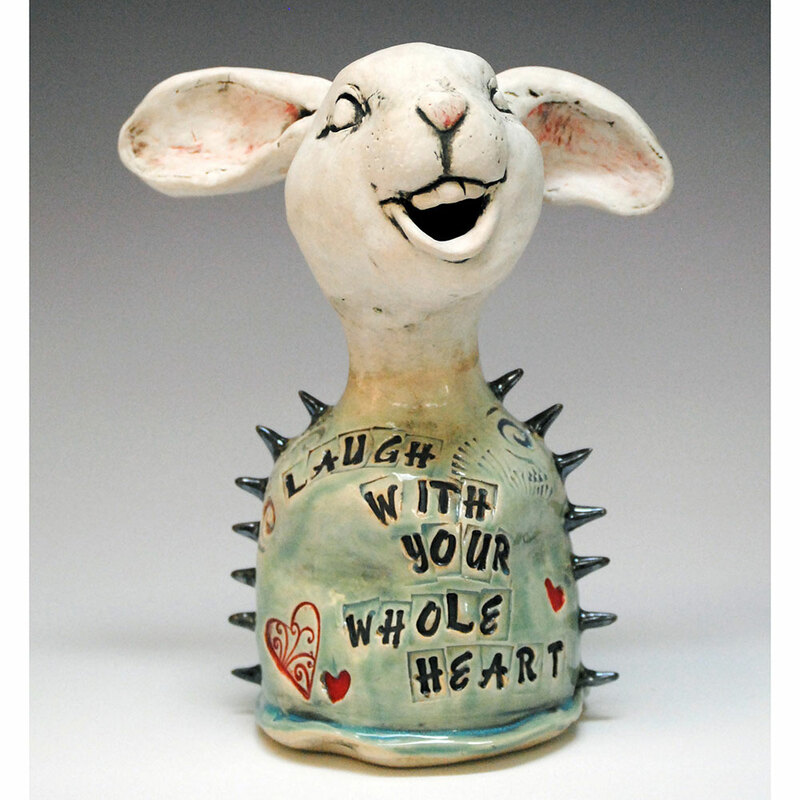 Local ceramic artist Alyssa Ligmont is also inspired by rabbits and will be making her debut at the WMODA museum shop in April. 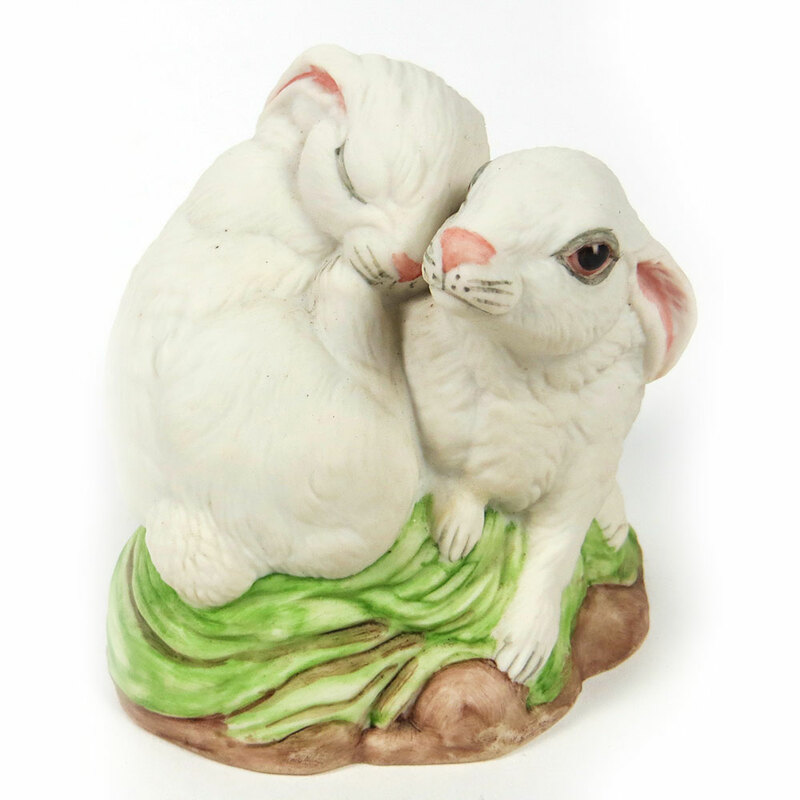 Cute white rabbits have long been a favorite subject for porcelain manufacturers as can be seen in the figurative sculptures by Rosenthal and Boehm. 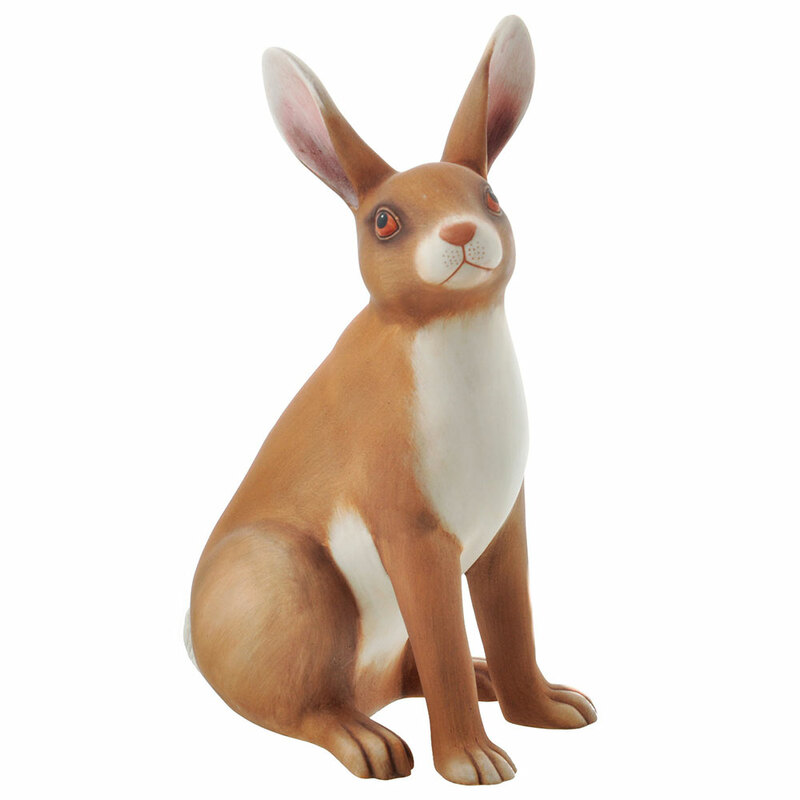 Several realistic studies of rabbits and hares have been produced by the Royal Doulton factory, notably Robert Jefferson’s limited-edition group of Snowshoe Hares from 1975. Their habitat is the North American mountain ranges as far north as the Arctic Ocean. 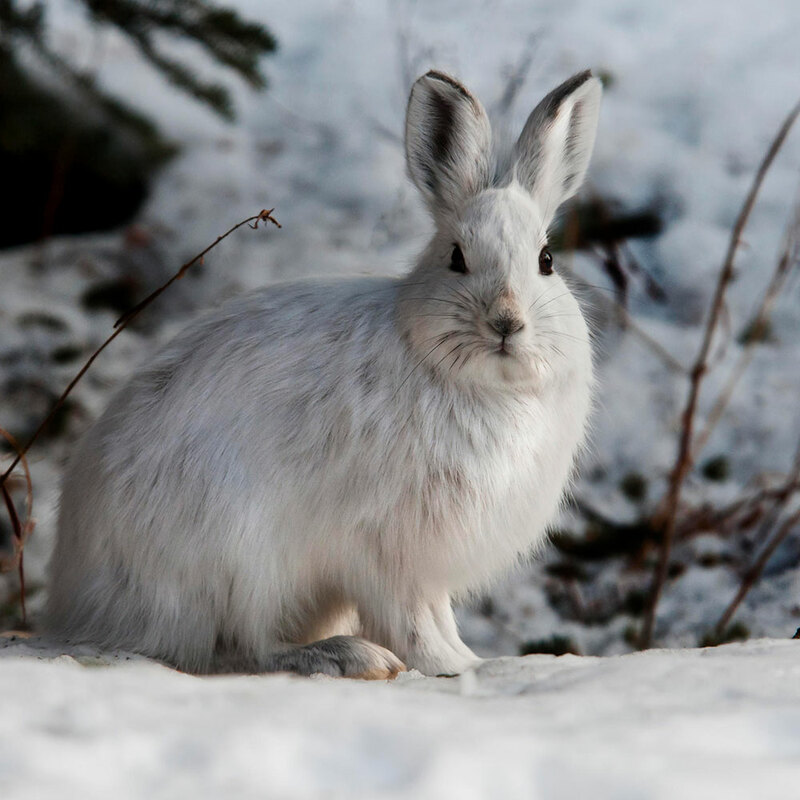 Snowshoe hares have large furry feet to help them move atop snow in the winter and they have a white winter coat that turns brown when the snow melts each spring. 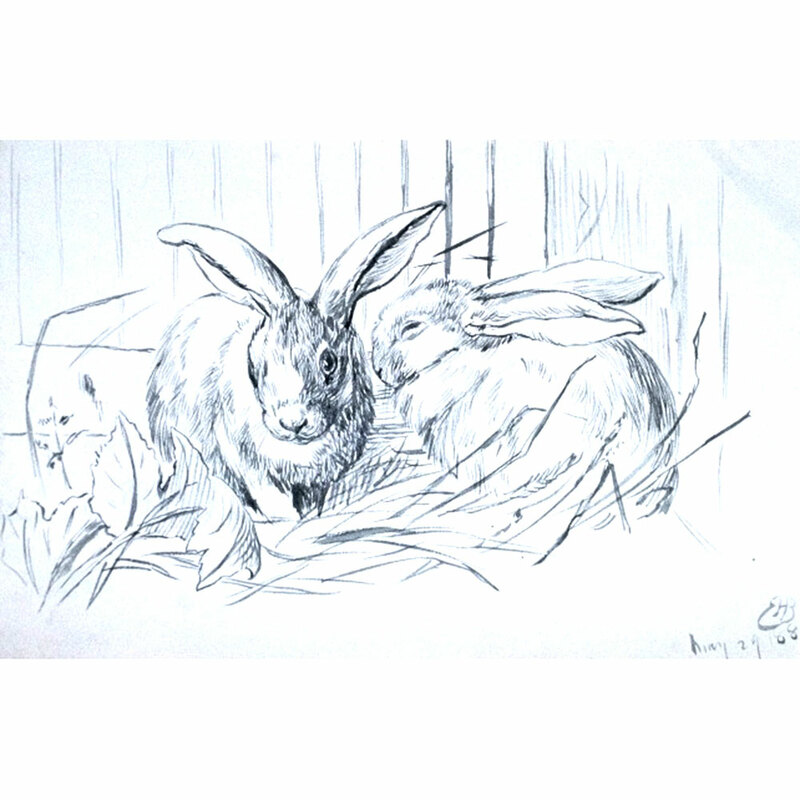 A female rabbit has a life-span of around ten years and generally has four to eight litters a year, each ranging in size from four to ten babies. The next generation reaches sexual maturity at six months and it has been estimated that one couple alone can have over thirteen million descendants in three years! Hop along to WMODA soon to see all the rabbits and hares this Easter.